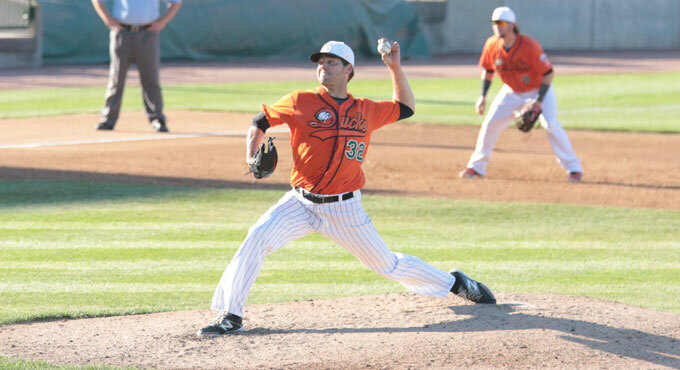 (Central Islip, N.Y., Aug. 10, 2015) – The three-time Atlantic League champion Long Island Ducks today announced that left-handed pitcher Rich Hill has been signed by the Boston Red Sox organization. He will report to the team’s Triple-A affiliate in Pawtucket, Rhode Island and is the Ducks’ 10th player signed by a Major League Baseball or foreign organization this season (Bobby Blevins, Taiwan; Kevin Vance, Diamondbacks; Trayvon Robinson, Diamondbacks; Mike Blanke, Red Sox; Hector Ambriz, Nationals; Mickey Jannis, Mets; Andrew Barbosa, Braves; Lew Ford, Mexico; Reegie Corona, Nationals). He also becomes the 79th Ducks player signed by MLB all-time. Hill made two starts with the Ducks after signing with the team on July 28. He pitched 11 scoreless innings and allowed just two hits and three walks while striking out 21 batters. In his debut on August 2, the lefty threw five innings of no-hit baseball, striking out seven and giving up only one walk after retiring the first 14 batters in order. On Sunday, he tied a franchise record for a single game by striking out 14 batters, matching the mark set by Mike Loree on September 15, 2011 at Southern Maryland. He finished with the outing by yielding just two hits and two walks in six scoreless innings. The Boston native will begin his second stint with the Red Sox organization. His first came from 2010-13 when he spent three seasons in the Major Leagues along with time at each minor league level. He began the 2014 season with Triple-A Pawtucket and went 3-3 with a 3.23 ERA and two saves in 25 games out of the bullpen. The 35-year-old has 10 seasons of big league experience, posting a 24-22 record with a 4.72 ERA in 197 games (70 starts). Hill was originally drafted by the Chicago Cubs in the fourth round of the 2002 amateur draft.